This game is really dull. There seems hardly any new players who join this game while it losses existing players. One of the major reasons: Lack of promotion of this game. So, come on! This Game has one of the best graphics, if not 'the best graphics', in entire collection of games on play store. Make a use of it! 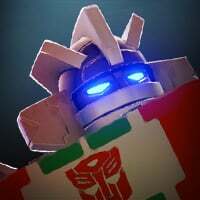 There's a media gallery on official FTF Site, which just has trailers, and there's not a scorponok trailer, so i guess that Page has gone froze too. It will not take much to revive that page. You can make some awesome wallpaper and post there. We will get some great Wallpaper and sharing them by us will be free promotion of the game. If not wallpapers, just make full body PNGs of the bots in the game available there as well as some landscape wallpapers of different battle grounds. The FTF Community never lacked creative minds. People like @woo224 will use them to maintain a Gorgeous Fandom FTF Wikia while Others will use them to Wallpapers or other stuff. In the End, it's gonna be win-win for Kabam as well as the Players. and pretty likely you may also new cool splash-screen this way. This may help to attract layer base, which will ultimately shift some of your attention from MCOC to TFTF. This game has potential to top all the games, just use it. I've also noticed that earlier you used to put announcements in news page Official site, as well as Dev's Interview on New bot release. That was quite good, guess you should resume it. I was wondering there's any way to get RSS Feeds of new updates and announcement of this game or personal notification on the forums. Actually, I was working on Rainmeter, and wanted to create a news skin for FTF Updates. All great ideas, but the fact that they abandoned basic, vanilla marketing of any kind in the first place pretty much shines all the light needed for a player to see the writing on the wall. But yeah, I agree; this game is one of the best games I've played (and definitely better than the other game) and has so much untapped potential still left in it. I hope Kabam can find a buyer for it who will truly do something with it instead of letting it fall into the state it has now.